"When Adam first brought up the idea of going to see our friends the Bergs he was inspired by seeing their lovely Christmas card on our wall for months. I had no idea how to make it happen but knew I wanted to try. I talked to the Bergs, who were delighted at the prospect, and to Adam's mom, Kathy, about some logistics. Then I got to the fun part. I started by asking Adam, should we fly? Go by bus? Drive a car? Take a train? And he said car! I asked again, telling him we would be in the car for 2 days, and he said "take it." So I took it from there, checking out how long the drive would be, what dates would work, where we could stay. And it all eventually fell into place with some wonderful help from community mates, family and friends all over. We are staying with my aunt and uncle tonight at their farm in Grants Pass, then headed to Redwood City tomorrow to see Beth and Robbie and their family. Saturday we will go to a meeting of "Bridges" which is the emerging L'Arche community in the Bay Area. Then we will head back to the Bergs's with them after the meeting. We will be hanging out with them for the rest of our tour." Read about the rest of their trip here. About Eric: Eric and his son Auggie live in an intentional Christian community called the Mystic Duplex in the Cully neighborhood of Northeast Portland. As a United Methodist deacon he wonders how spiritual intentional communities of all shapes and sizes will shape our city for the common good. For the past 5 years, Eric has been responsible for donor relations & communications at Camp and Retreat Ministries. Eric enjoys walking through the woods in all kinds of weather, running, hauling Auggie around on the back of the electric cargo bike, the local beverage scene, socializing with friends, and his favorite sports teams will always be: the Chicago Cubs. Be sure to say hello and welcome Eric when you see him around! 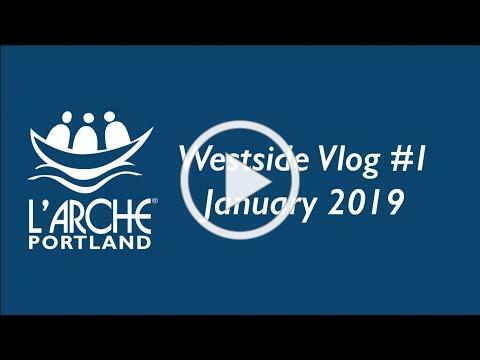 In our first Westside Vlog, Jessica provides updates on the new community we're building on the west side of Portland. At our January L'Arche@Tabor event, Self Advocates Taking Action presented about what self advocacy is and how we can use it in our everyday lives. Meetings occur the second Friday of the month from 11am - 1pm at the Seven Corners Collaborative (2475 SE Ladd Ave). There is a meeting this Friday! A new volunteer led a yoga session in the office last week. A few office members got a good stretch in, Adam welcomed the opportunity to high-five outstretched arms, and Joni cheered everyone on. The newest page on our website provides a place to find out what other L'Arche community members have been reading and express interest in starting or joining a book club. Click here to see what we're reading. The Today Show produced a great video about our friends at L'Arche Atlanta. Click the image below to check it out! This month we are celebrating all of our wonderful volunteers at our L'Arche@ events. Join us to say thank you or to be thanked! Join us for a monthly potluck dinner and community celebration! Open your hearts to friends with and without intellectual disabilities, discover a community of belonging and inclusion, and engage in activities and discussions that feed our spirit. As we prepare to open a new home in Beaverton, we are also establishing a new circle of friends. This gathering will become the place of welcome on the westside, introducing what L'Arche is and can be, celebrating our differences and gifts, and offering a place where faith is fed and deepened. An ecumenical community gathering of university students and adults with and without intellectual disabilities. We encourage people with intellectual disabilities to participate and lead from their gifts and faith alongside their peers at UP. Help L'Arche Portland continue to create home, share life and build community as people with and without intellectual disabilities. Will you support our efforts by making a gift today or joining as a monthly sustainer to ensure that people with intellectual disabilities are at the heart caring, respectful and inclusive communities?